Patricia "Tricia" Bunker, left, is pictured with Amanda Bridges at the annual Georgia Education Advancement Council Inc. (GEAC) conference in November. Bunker, director of donor relations and stewardship at the University of North Georgia (UNG), won the award of excellence for advancement services. Bridges, assistant vice president for advancement at UNG, nominated Bunker for the award. 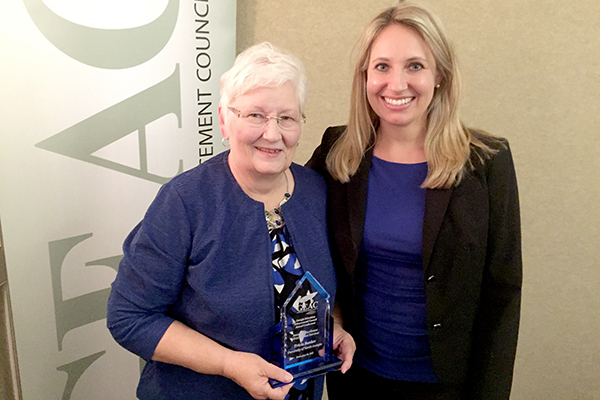 A handful of years ago, Patricia "Tricia" Bunker suggested the Georgia Education Advancement Council Inc. (GEAC) include a new award at its annual awards banquet. "Advancement services was the only major area that wasn't recognized," said Bunker, director of donor relations and stewardship at UNG. "They had achievement awards for marketing and alumni relations and others. I thought it was time to add the award and to recognize people behind the scenes." GEAC board members added the new award; this year Bunker received it. "I was in shock," said Bunker, who was also surprised by her daughter's appearance at the awards banquet Nov. 16 at Brasstown Valley Resort in Young Harris, Georgia. Receiving the award marked a poignant end to Bunker's career at UNG. She is retiring Dec. 31 after 13 years with UNG. However, she does not take credit for her accomplishments. "Advancement services is such a team effort because no one person can really drive everything," she said. "You need a team that works cohesively together." Amanda Bridges, assistant vice president for advancement at UNG, said Bunker deserves the award. "Her knowledge of our finances, data, database, donors and their stories, and the important historic role of two critical institutions make her an excellent advancement professional," she said.